There have been many changes with TAM since I last flew with them in 2010 (for the review, click here). Back then the carrier had just joined Star Alliance under the wing of Lufthansa, and had introduced first class to the B777-300ER fleet flying from Europe to Brazil (see news November 2012). Since then the airline merged with LAN (see news June 2012), left Star Alliance and joined Oneworld in 2014 (see news October 2013), and removed first class on board to make more room for a Premium business Class (and also because of lack of demand) – see news May 2014. For many years TAM operated out of Heathrow Terminal 4, and then for the last four years from Terminal 1. At the end of May this year (2015) it moved to Terminal 3 (see news April 2015). I arrived at London Heathrow Terminal 3 at 2020 for my 2210 departure on flight JJ8085, a flight of 11 hours. TAM check-in is at Zone E, and there was no queue at the business class check in. I had only hand luggage and so went up the escalator to fast track. Once there I tried scanning my boarding card and the machine said I should seek assistance. I was then told that “TAM does not pay for fast track” and was redirected to the main security queue. This took around ten minutes and then I walked to the Oneworld lounge. This is the BA Galleries Lounge (or First if you are a Gold Card holder with BA or Emerald with Oneworld). I handed my boarding card to the receptionist and was asked if I was flying business class. I said I was and thought I should be admitted. This was then achieved. The lounge was pretty busy at this time (2100) though this might be because of Emirates using the lounge while its own was being refurbished. I saw from the board that the flight started to board at around 2110 and so did not wait for a boarding announcement (if there was one) and walked to Gate 34, which is a ten-minute walk from the lounge. Once there boarding had begun and I walked on board. 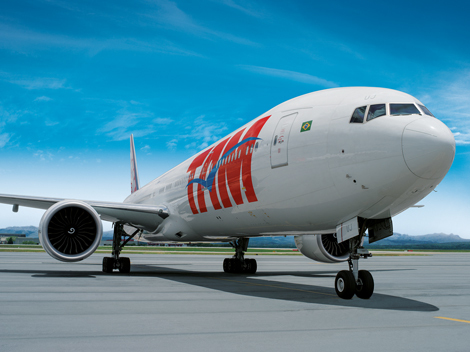 TAM serves this route with a B777-300ER, one of ten that it has in its fleet. 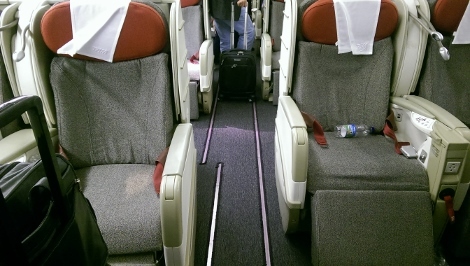 All ten of these have recently been reconfigured to remove first class and give more room to business class. 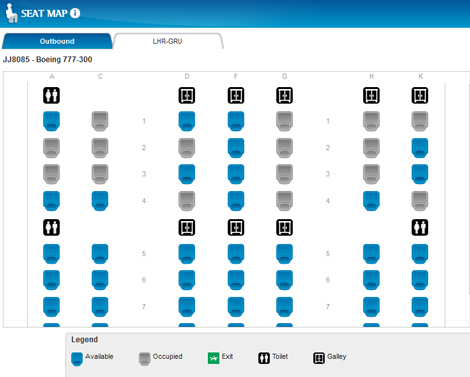 We are having a new seat map drawn up of the aircraft, but in the meantime here is a screen grab I took by making a shadow booking on the site. 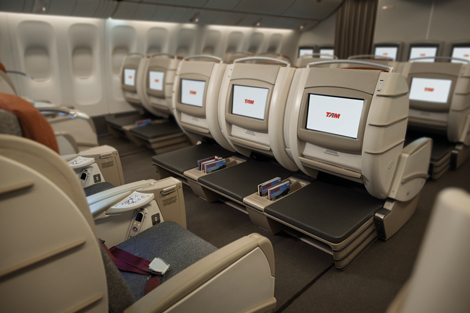 The business section which is a 2-3-2 configuration is in two cabins, with rows 1-4 in the first cabin and then rows 5-8 in the second making a total of 56 business class seats. The seat has changed since I was last on board and there is more space, with a low ottoman in place with room underneath for a small bag (a laptop bag would fit under there, a wheelie bag would not). I was in seat 1K, a window seat, and when I arrived on board was asked if I wanted Champagne or water, which came with a small bowl of nuts. My jacket was taken and I sat down and then started to work, since it was still 45 minutes to the departure time and the cabin had yet to fill up. 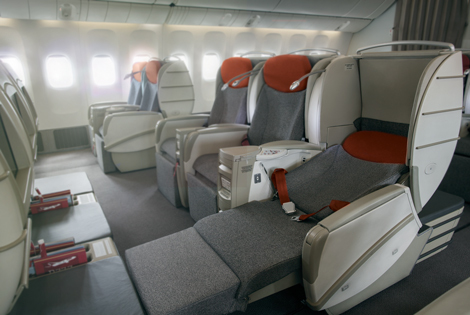 The seats have red head rests and a grey fine check pattern, and a sort of beige for the arm rests. There is a power point for each seat taking US or European-style plugs, as well as a USB point under the arm. Typically it is said this does not charge the device, though I’ve found if you leave the device turned off during a long flight it does charge it. The central arm for the seat (ie: between the seats) has enough room for a drink, while the other is where the meal table folds out from. This wasn’t very robust, and slanted slightly to the point that although I used it to support the tray on which my food was delivered, when I worked on my laptop I put the table away and worked on my lap. 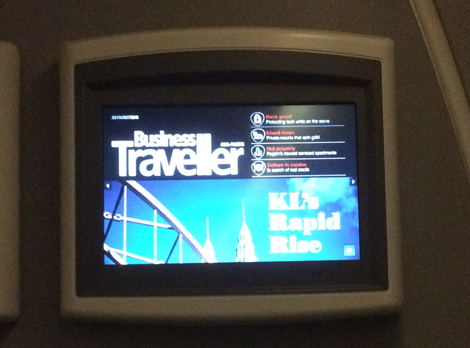 The IFE screens were turned off when we boarded but I turned mine on and the entertainment started – there was a fair choice of films on this Panasonic System including eReader magazines and books and I was pleased to see the US and Asia-Pacific versions of Business Traveller magazine available. Obviously the middle seat is not a good one, but in terms of window or aisle it’s fairly easy to get in and out of your seat without disturbing the person on the aisle, though you do need the ability to lift up your legs reasonably high if their seat is fully reclined, as you step over the legs of the passenger in the aisle. 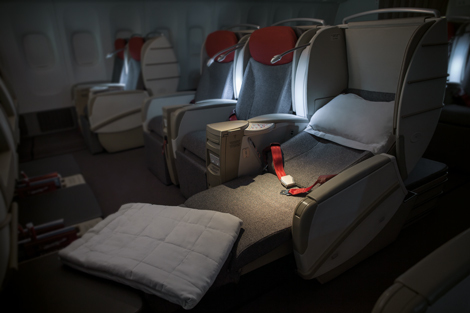 The window seats also have enough room between the edge of the seat and the wall of the aircraft to place a good-sized bag, allowing me to have this with me even as I reclined the seat for sleep, useful for stowing objects you might need such as iPad, Kindle or laptop. All window seats have windows (none blocked off). The meal service comes from the front of the aircraft (at least in the case of this front cabin). 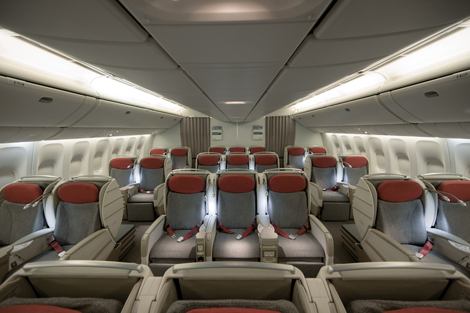 There are two washrooms at the front on the left, so perhaps there is slightly less noise (from the flushing) on the right of the aircraft, so perhaps seats 2 and 3K would be my choice. Also note that because the aisle narrows towards the front of the aircraft, you may well get knocked in the aisle seats in row 1. The crew were friendly, but I felt it took a long time to get the meal service going. We took off on time at 2210 and after take-off we were asked for our preferences from the menu (see below) but it was 2310 before we were offered drinks, and these came with the meal service which was delivered from a trolley on a tray. Before the meal we were also handed a good sized duvet for our sleep, and a bottle of water, since some passengers were not eating but choosing to go straight to sleep. At the same time we were also handed a pre-order form for our breakfast, specifying if we wanted breakfast, and if we did, what we wished (see below). 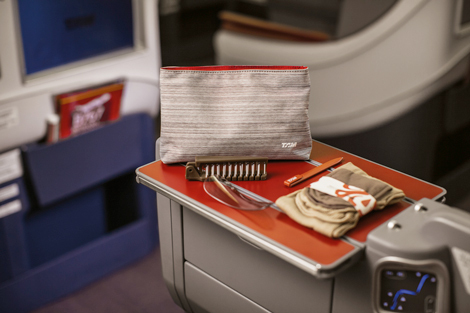 Amenity bags were also given out with ear plugs, socks, eye mask, toothbrush and toothpaste, shoe horn (very useful after a long flight), moisturiser and lip balm (Rituals brand). Pollock wrapped in prosciutto, basmati rice with lentils and baby carrots. I had the ravioli, which was tasty but a small portion, probably my fault for saying I didn’t want the soup, but I made up for it by having two lots of Cookies and cream Haagen Dazs ice cream. After the meal service (0015) there was probably the third announcement about duty free which interrupted the IFE and then after that option had passed through the cabin the lights were dimmed. Since I had hand luggage only, I also had some pyjamas so I changed out of my suit and into those in one of the two washrooms at the front. Then I reclined my seat using the preset button. When fully reclined the seat does slant so is not completely flat, but it is comfortable and reasonably wide since the side armrest lowers to create a little more room (not that much, though, it does not recline flush with the seat. Perhaps this is a safety measure, or just because it is this arm that the meal table comes out of this arm. The cabin was very quiet, as were the flight attendants, and after reading for a few minutes I had no problem sleeping for six hours. I woke as my neighbour was being served breakfast. Since this had been pre ordered it was delivered ready-made up on a tray. Again the service was friendly, and I think the occasional mishaps were more to do with language than training (a refill of coffee was requested but then instead of it coming my cup was removed. The cabin light remained dimmed however (and the cabin quiet) right the way through until 20 minutes before landing, which I was impressed with, since some were making the most of the sleep time. That said there was an almighty crash from the front cabin as something was dropped about this time. It’s a long flight for the flight attendants however, and they were still smiling at the end of it. I filled in the immigration card which said they were looking forward to welcoming me in Brazil for the World Cup in 2014. We landed early at 0510 at a remote stand, but then it took 15 minutes to get buses to the aircraft, and it was a slow transfer to immigration at the new Terminal 3 at . “Foreigners” were then in a queue, and this took perhaps 30 minutes to process. I had no bags to pick up but then joined another ten-minute queue to file out of the airport through customers. We got out of the airport 90 minutes after landing, which was disappointing, since it then meant we were hitting the beginning of Sao Paulo’s morning traffic. This was a good on-time flight, with friendly staff, room to work and a comfortable bed for sleeping – not fully flat, but very close to it and with a lot of thought clearly having been given to the service. I’d drop the number of duty free announcements and speed up the intial rinks offering, but other than that TAM I clearly on the right track with the service and product. We will be looking forward to the arrival of the A350 at the end of this year, and it’s arrival on the Madrid –Sao Paulo route in April 2016.